Seniors are all smiles on Santa Clarita property at the Santa Clarita Valley Senior Center. An amazing resource for those in their golden years, the facility holds a variety of workshops, classes and programs just for the elderly. Locals over sixty keep on learning with a full calendar of classes. Fitness is a key component to staying healthy. High energy fills the room for Zumba while the mood becomes flexible during yoga and chair yoga. Dance classes sway to the beat with swing dance. Next door line dancing kicks it up a notch. Creative juices flow with arts and crafts. Friends share the gift of gab during knitting and needlepoint circles. Lighthearted bouts of competition is the norm for bingo, chess, billiards and card games. New languages are easily mastered as is the latest in technology tools. Traveling is for the young at heart of any age. Trips and tours are regularly scheduled to various locations of interest. Local excursions feature destinations such as the San Manuel Casinos, Santa Anita Race Track and Descanso Gardens. Longer jaunts find Santa Clarita property residents escaping out of state and sometimes even out of the country. Leading the charge the center offers the only adult day program for those diagnosed with Dementia, Parkinson’s and Alzheimer's disease in the Santa Clarita Valley. 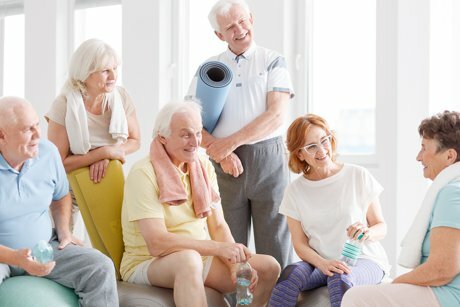 Quality care including social engagement and mental and physical stimulation is designed to promote independence and the ability to remain in one’s own Santa Clarita home for as long as possible. More details are available here. Located at 22900 Market Street the Santa Clarita Valley Center is easily accessible. Hours are Monday through Friday from 8 a.m. to 4:30. Outside assistance is provided for homebound seniors including transportation and meal delivery. Additional information regarding these services and others can be obtained by calling 661.259.9444.